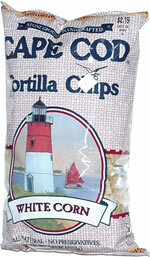 Taste test: These are really good tortilla chips. They're thick, crunchy and have a nice taste. You can tell from the texture that they really are made from stone ground corn meal  it's noticeably different from most tortilla chips. Good stuff, as we've come to expect from Cape Cod. Smell test: Regular tortilla chips aroma.